and one has an interior generated by Draft2Digital. Which is best? This is a post for authors who like to know about different ways of generating the interiors for paperback books. I'm a big fan of Draft2Digital [D2D hereafter] for e-book distribution. Many authors praise D2D but only use them for vendors the author can't distribute to directly. That's because D2D take a 10% cut of the retail price (c. 15% of the net profits), so most authors skip that by going direct to Amazon, Apple, Kobo etc, and just using D2D for other vendors. However, I do currently use D2D for all store fronts. Sure, the 10-15% cut can smart slightly, but Draft2Digital's automated pre- and end-matter does save me time keeping different versions of my books up to date - and that will only become more significant as time goes by and the number of my published titles increases. 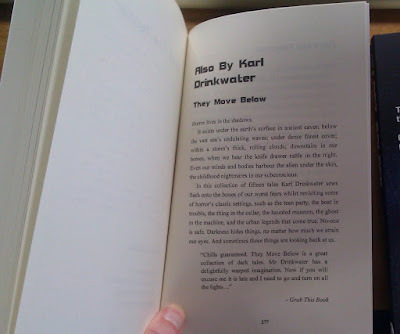 If my author biography changes I only have to update it on D2D and the new bio will appear in all my e-books; same when I publish a new title and the list of books "Also By Karl Drinkwater" gets automatically updated. Cutting out some admin can free up time for writing and promotion. It's something I'm keeping an eye on and will perhaps reconsider further down the line. One of the bonuses D2D offered was a free paperback interior PDF that they generate automatically from the e-book file, and you can use the PDF as you wish (e.g. 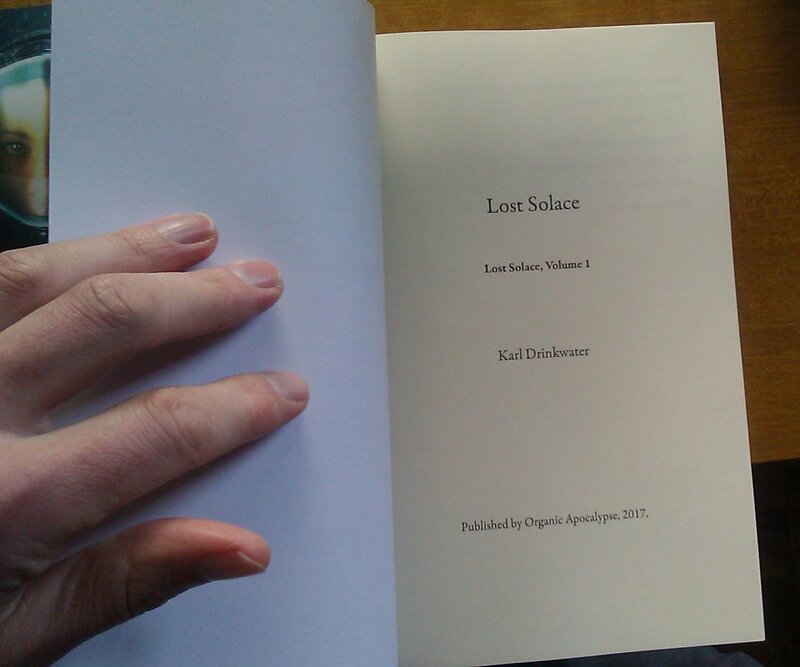 for with print-on-demand [POD] paperback distributors). I have played around with it a bit and identified some bugs, some features, and some issues that could be improved in the D2D-generated PDFs. One of the things that held me back from experimenting more, and possibly starting to use the D2D interiors, is that because it is just a free add-on service they offer, they might withdraw it at any time. The last thing an author wants is to use a service for their interiors, then find they can't be updated any more, and you need to have them all remade or updated in some other way. Well, the good news is that D2D recently announced that they were moving into print distribution as well, which is probably one of the reasons they had been working on this PDF interior service. Hopefully that makes it more likely that their free PDF interiors will stay, and perhaps be worth considering as a way of generating nicely-designed paperback interiors in the future. Why would anyone consider D2D print interiors? Well, it can certainly cut down on formatting time, at the expense of options. The idea of only needing one master file for each title, and being able to generate all my e-books and print books from that single file is incredibly appealing in terms of saving time and making changes. Since D2D are a US company I doubt if they'd be an ideal match for distributing UK books (e.g. they only currently provide author copies to US and Canadian addresses) but the interiors could still be useful. As such, I decided to do an experiment. I already had a lovely interior for the paperback of Lost Solace. I then set up a private project at IngramSpark and uploaded the D2D-generated PDF as the paperback's interior. I used the same cover (even though I knew it wouldn't fit the new page count) and bought a copy of this new book to compare to my custom interior. I've taken photos to illustrate some of the things I noticed. This is an easy win for my custom interior. An aspect of good book design is that the title page should tie in with the cover in terms of the fonts used (at least the title font, maybe also the author name font). 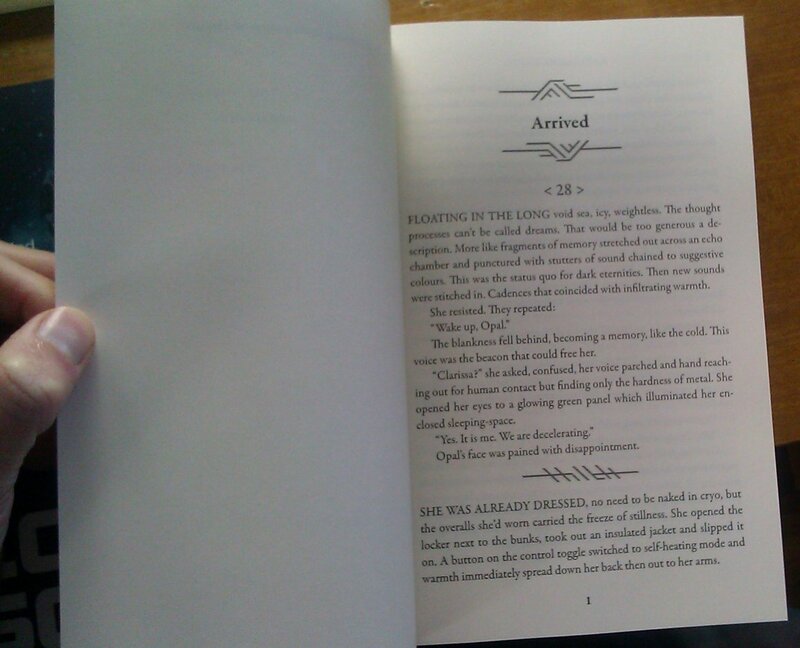 Chapter titles throughout many books will also be in the same font as the book's title. As you can see, my custom interior does this nicely, matching the title on the cover (and also the author name font, though not in caps). The D2D interior looks a lot more bland by comparison. 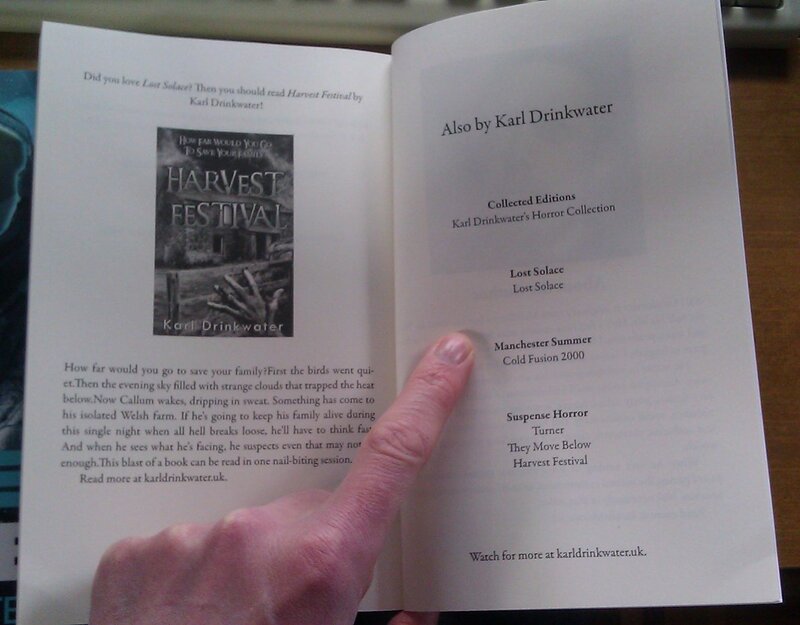 My interior also has the publisher imprint and their colophon (logo) which looks nicer than just using text. A title page can be an attractive thing in itself, so the custom interior wins out there too. One interesting thing with the D2D interior is that - if the book is part of a series - it includes a line indicating the book's place in that series. That can be a nice touch. I have some thoughts about how D2D deals with series, which I will get to later. As an aside, there are two ways that the book title on the title page can match the cover. One is to do it with text, and just use the same font that was used on the cover. As long as the fonts are embedded in the PDF, then they will display perfectly. The other way is to grab the title as an image from the cover file (with a white or transparent background). Many cover designers will provide a separate file of just the title (or title and author) for this exact reason, especially if it includes any additional decoration. That's the route I went down here, because the title treatment has a particular layout with horizontal bars. That can only be exactly matched as an image, not plain text. When D2D generate the interiors there is probably no easy way for them to match the correct font for the title on the title page - it would have to be embedded and uploaded as part of the source file, and even then might be problematic. An easier way would be for D2D to offer more options for the title page, including a jpg/png for the book's title which would go in place of the plain text title (possibly in the e-books too). Maybe also for the publisher colophon (with additional tick boxes for whether to include fields like author, publisher, series position etc). Or for there to be the option of uploading a full title page as an attractive image, perhaps acting as a half title and followed by the plainer, machine-readable D2D title page. So there's no reason why D2D couldn't have a title page for your book in print (and possibly e-book) that exactly matched the cover. Currently you can achieve a similar effect with the workaround of uploading a title page image within the file so that it remains in all the files D2D create. You can elect to add or remove the D2D generated plain text Title page from Step 2 of the process as needed by placing a check in the box for D2D to create a title page, or removing the check mark from that option to remove it. Things are kind of equal here. My custom interior has a long copyright section because - rather than tell readers what they can't do - I like to tell them that they can do more than the law normally allows with my books. It's one of the reasons my books are excluded from copying schemes (PLR, ALCS etc) - because if I was to join those licensing societies my readers would have fewer rights. Also, my copyright page includes information such as the ISBNs for the various formats, which is useful to readers, librarians, and booksellers. 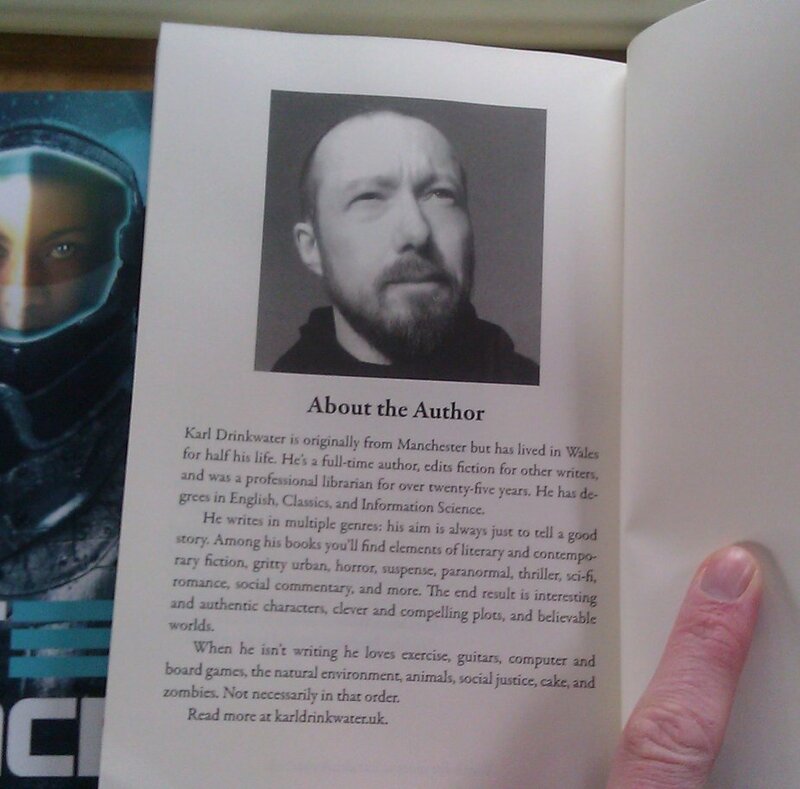 However, the D2D copyright page is tidy and short, and that's nice too. The acknowledgements page is fairly similar. I prefer having the acknowledgement further down the page (as with my custom interior), and italicised, but it isn't a big issue. First appearances are both good, probably a draw. With my custom interior the chapter titles are in the font used for the title on the cover, which is always a nice touch. 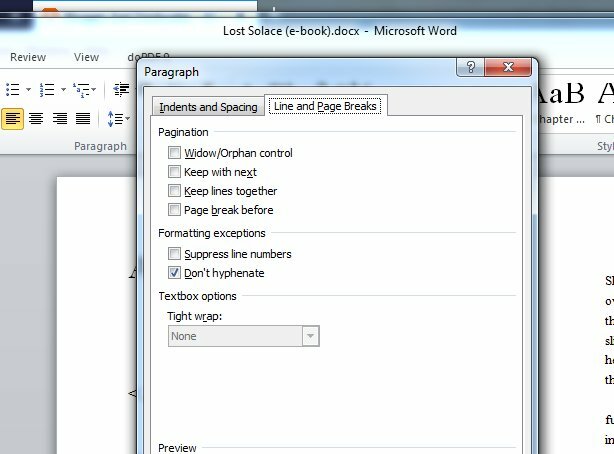 I normally separate sections by having a couple of blank lines followed by a non-indented paragraph that begins with small caps. It is tidy and easy to follow. With the D2D interior the chapter number had to go below the chapter name (they have to be kept separate in this book so that the number does not appear in the Table of Contents - for reasons related to the story). The fonts don't match the book cover but that doesn't matter, because the nice design of chapter headings and section breaks makes up for it. D2D include a fair few options for designs that can work with different genres, and I quite like the lines design I chose here for sci-fi. D2D may introduce more designs in the future. The advantage here is that the chapter heads and section breaks may not match the cover, but they do match the ones used in the e-book, which is nicely unifying. So I am happy with both interiors, for different reasons. There are other differences relating to how closely-packed the text is - I'll discuss that in more detail below, in the section about book lengths. US style - author on the left, book title on the right. This is what D2D uses. Book title on the left, story name/chapter title on the right. I generally prefer this. 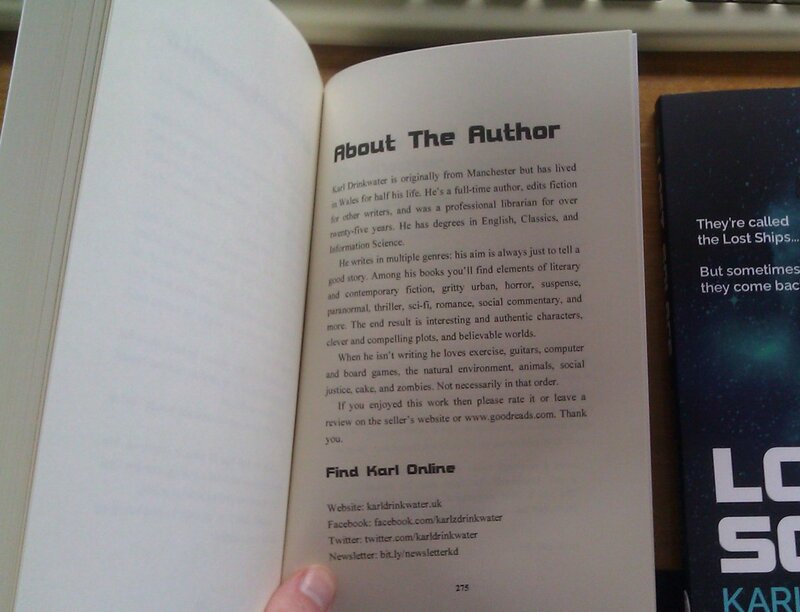 Who wants to be reminded of the author every single page? You can just look on the cover for that. This option is actually more useful for navigation and keeping the reader aware of the story (if it is a short story collection) or the title of the chapter (if the chapters have relevant titles). This is what I use in my short story collections and in Lost Solace. Obviously this system is useless for books that don't have chapters, or where the chapters are just numbers. That's probably why D2D don't make it an option, they just go for the US default. To have no running heads at all (apart from page numbers, if the page numbers are at the top rather than the bottom of the page). I favour this for books where the chapters are numbered, or there aren't chapter subdivisions. After all, it's easy to look at the book's cover if you forgot the author or title and suddenly need to know - it's rather distracting to be reminded of it every page, which makes me think the publisher or author are insecure. There are many different options too as to whether the running heads are bold or not, caps or not, italics or not, and so on. D2D go for the maximum shout with bold caps, which seems a bit too imposing to me. 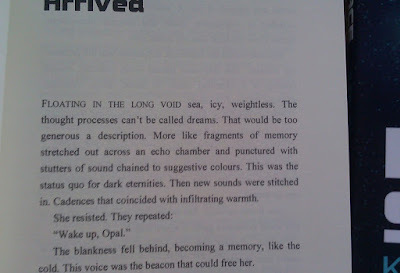 If I use running heads then I prefer the book title in caps but not bold, and the story name/chapter title in standard case italics, and both smaller than the normal body text. They are less distracting then. If I was forced to use the US system I would drop the bold, decrease font size slightly, and italicise the book title. So, although I prefer my choices (2 and 3 above), the D2D interior (1) is still fairly standard. On the one hand I like the other options and choices you don't get with D2D; on the other hand, there's something to be said for keeping it simple and just doing the same thing every time, so I am not going to score D2D down for that. You can see the differences in page numbering for yourself. I think both options are okay. There are many elements of book design that the average reader won't notice: things to do with spacing, dealing with widows and orphans, using non-breaking spaces etc. These are all elements used to best fit the story onto an unchanging physical page without drawing attention to any problems. (Many of them don't apply to e-books, which use reflowable text and over-riding user-preferences, so the designer doesn't have - or need - control over these elements any more). Hyphenation is one element. Books use a block design - look at the left and right margins of the text and you'll see them neatly lined up (apart from the indent at the starts and ends of paragraphs). This effect is achieved by subtly altering the width of the spacing between words. The downside is that when a line has only a few words (e.g. very long words), the spacing can get screwed up and draw attention to itself. The way around it is to break one of the words up with a hyphen and run it onto the next line, allowing the spaces to become smaller again. There is no right or wrong here, apart from when hyphenation or spacing draws too much attention to itself. It is therefore subjective. 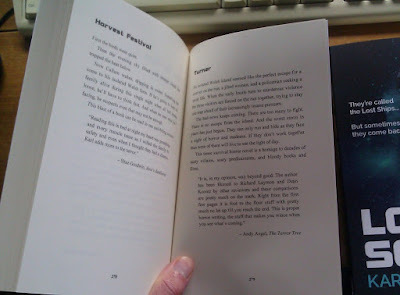 However, in most cases the hyphens are added by software, which works on hard rules with no account for how they affect the appearance of an individual paragraph in a book. This is why I waver back and forth about them. I find that Microsoft Word creates too many hyphens when you have hyphenation on, and they become distracting. (They can also cause problems with converting the text, with hyphens becoming parts of the words even when they aren't at the end of the line.) So I generally do away with end-line hyphens completely, and instead have to face some lines where the spacing draws attention to itself instead. If you look at the images above and below, you'll see that - even though my interiors have hyphenation turned off - D2D has added them in based on their own algorithms. Which looks better? I think they are both fine. No doubt there might be occasional lines under either system that stand out, but for the most part both options work well. It looks like D2D's hyphenation options are more restrained than those of Microsoft Word. So, although D2D don't offer any options here, I think their solution is perfectly acceptable. This is interesting. 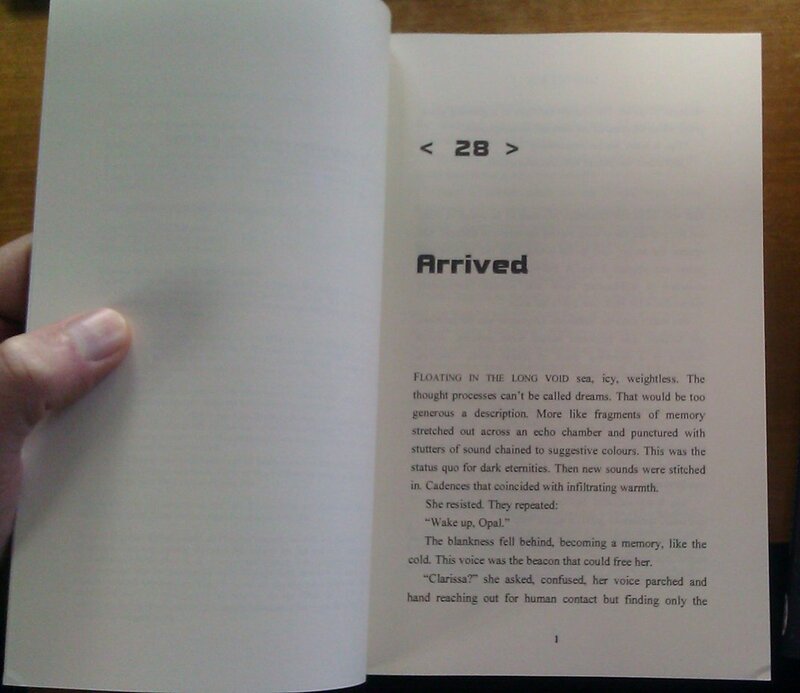 In my custom interior the story ends on page 271. 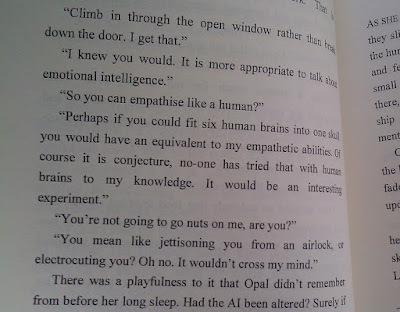 In the D2D interior it ends on page 210. 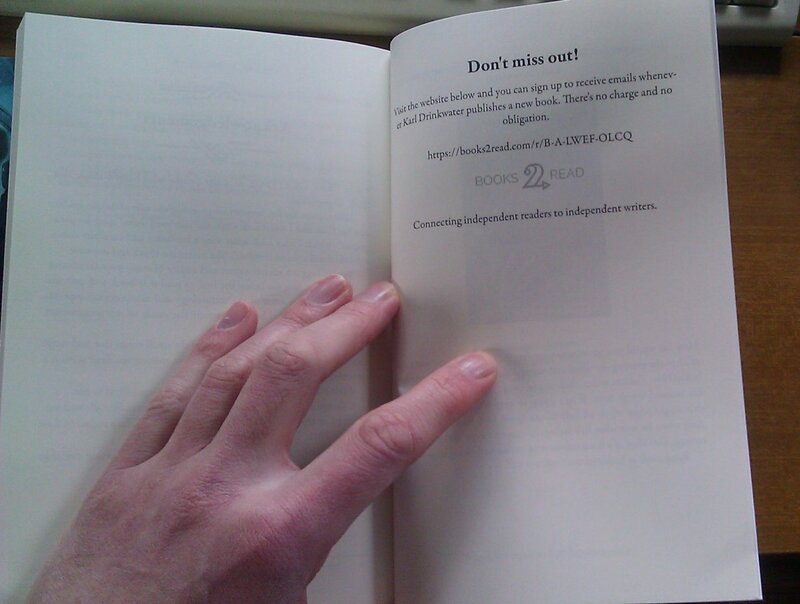 The D2D interior is 61 pages / 23% shorter. 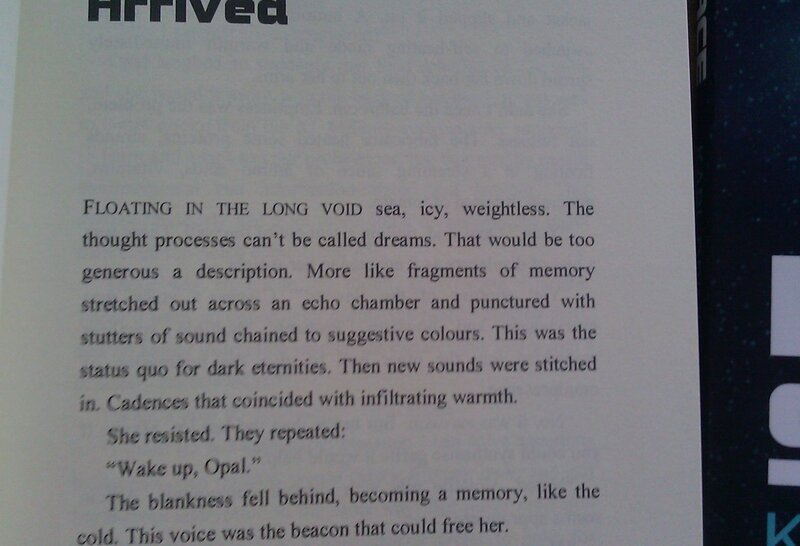 That's because D2D's combination of interior spacing, font size and layout fits more words on to a page. There are a few implications here. The fewer the pages, the cheaper the book is to print. So a D2D interior means the final book costs less for the reader whilst still making the same profit for the author/publisher. A lower end price may mean more sales. Of course, if the lower page count is at the expense of readability, then the book may be cheaper, but it may also be less attractive to the reader, looking slightly cluttered rather than luxuriously spacious. 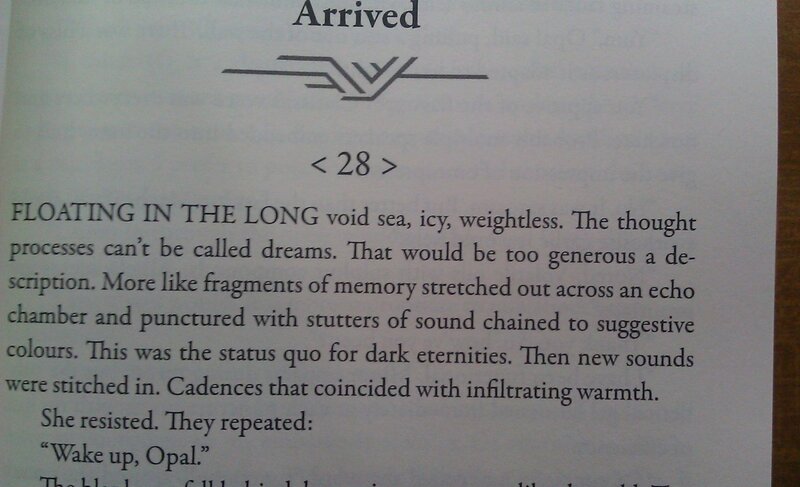 It would be interesting to know what font, size, and spacing (paragraph and margins) D2D use. 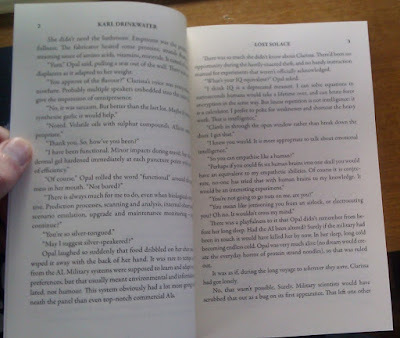 When I flick through both paperbacks the D2D interior does look slightly more dense, but I think it is still within the realms of comfortable readability. Have a look at some of the earlier photo comparisons to see what you think. In a few random samples, my custom interior might fit 9-10 words to a line, whereas D2D fits 11-12 words on, which explains part of the page reduction. The size of the book can be important. 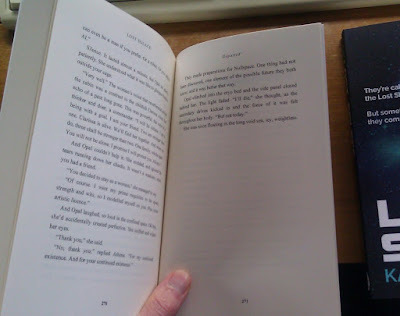 If I had a novel of 500 pages then I'd be looking for designs that condense the text to reduce the number of pages, so that the book doesn't end up as an unwieldy brick. The compromise is that it is likely to be a bit harder to read (smaller font etc). In these cases, the D2D interior wins out quite well, with its significant page reduction. The dimensions of the front and rear covers are determined by the trim size of the book. My books are published in one of the UK standard trim sizes of 5.5 x 8.5 inches. However, the spine's width is determined by the number of pages. 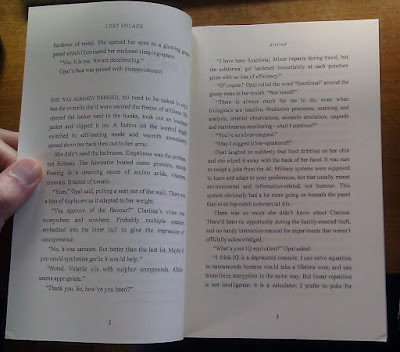 This is why you can't make big changes to a book's interior that will affect the number of pages without also modifying the cover file to accommodate the increase or reduction by extending or shrinking the spine width. And because the spine is in the middle of the image, it has knock-on effects on all the other cover elements. You can't just make the spine wider, because that would force the front and back cover edges out of the canvas, meaning the cover was no longer big enough to wrap up the book. So you would have to somehow extend the image, or resize all the elements. As you can imagine, this is not a trivial task. 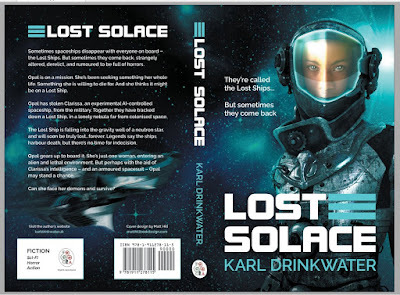 It's why paperback cover designers need an accurate page count as early in the process of design as they can get it. 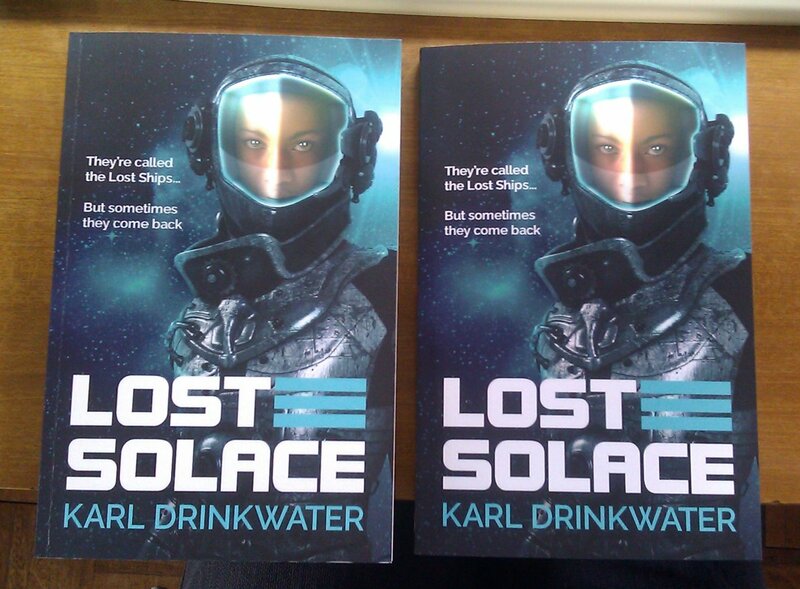 If resizing a paperback cover is a pain, why not just keep the existing one? Well, it either wouldn't fit, and would be rejected (assuming the page count had gone up); or, if the page count went down a lot, it would fit on but the spine would wrap on to the front and back covers, pushing those elements to the edge of the book and looking a bit of a mess. A change of up to ten pages and this wouldn't be noticeable, but with 61 pages it definitely is. I can see it on the paperbacks in front of me when held side on - in the shorter D2D interior, the publisher colophon begins to wrap onto the back cover (I knew that would be the case and it is fine, because that book was just printed for this test and would never go into distribution as it is). The only implication here is that if I switched to the D2D interiors for my existing titles, I'd have to get the paperback covers redesigned to accommodate it, which is a fair bit of work, and why it wouldn't be worth doing unless I knew the D2D interiors were going to be around for good. It's why I'd like the full list of settings for how they are generated - font, font size, paragraph spacing, margins etc - since with that information it would be possible to manually recreate a D2D-similar interior with the same page count, even if D2D ever folded. Of course, if I used D2D interiors for new books it would be fine, and I would have the covers designed around their page counts. 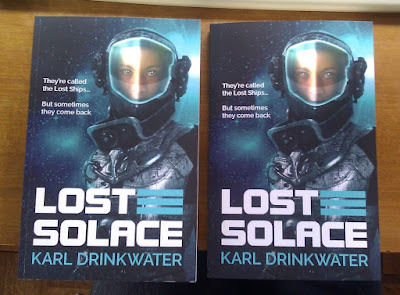 It is only changing interiors for published books that already have paperback covers where it would be a pain (and that's not the fault of D2D in any way, just a point to note for anyone thinking of changing their existing paperback interiors). After the story has finished, most books have some final pages - teasers, pages about the author and so on. One of the nice things about D2D is that they automate a lot of this process. You can make a change once, and they update all your e-books for you. As an author or publisher's total number of titles grows, this can become even more important. In a custom design you can obviously include whatever you wish. D2D offer some automated options. Let's compare a few of them. 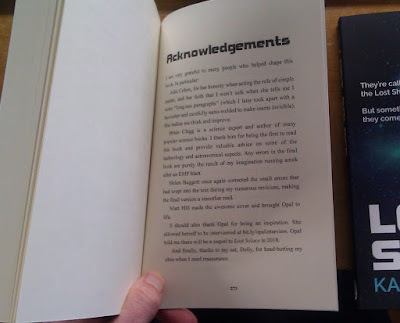 Acknowledgements - it looks fine in both books to me. You get a clear indication of how the D2D interior crams more words on to a line, as already discussed. I quite like the way D2D automatically spotted a hyperlink and put the URL in a footnote for the paperback (leaving it as a normal hyperlink in the e-book). So, these are equally acceptable to me. Sign up - D2D give you the option of the sign up page above. That's a really nice touch. You can't control the wording, but that helps to keep it hassle free. Two things spring to mind. One is that readers are signing up to D2D's notification service (rather than your newsletter, or anything else you control directly). That means if D2D ever disappeared or stopped running this service, all those people who signed up would be cut off - you'd have no way of knowing who the interested readers were, or contacting them. On the other hand, it means there is no admin overhead for the author/publisher, since D2D deal with it all for you. It's especially attractive to authors without their own mailing lists. As an aside while talking about custom URLs, D2D also have UBLs - "Universal Book Links" - and Book Tabs. 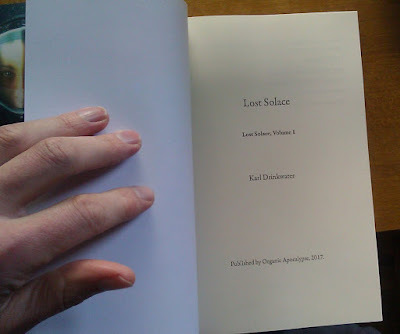 The UBL is a page for each book with links to different vendors, so for Lost Solace the D2D UBL is https://www.books2read.com/u/38gAnr and the Book Tab (with more information, such as a synopsis) is https://www.books2read.com/b/38gAnr - so it is the same URL, but with the sub folder /u/ (UBL) switched for /b/ (Book Tab). Yes, it is a bit ugly. As a result D2D introduced the ability to customise the URL for the UBL some time ago, and I chose to replace /38gAnr with /LostSolace (and did the same with my other books, replacing the random code with the book title). This is a slightly nicer URL to share. Then D2D kept the custom URL but changed where it pointed - instead of the UBL, it now points to the Book Tab. 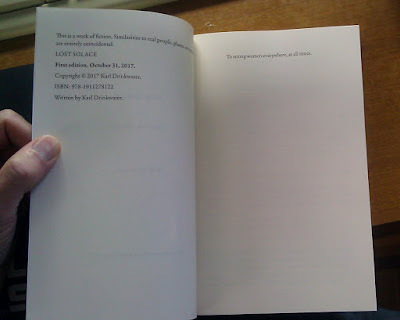 That's fine, because the Book Tab link is the one more likely to be shared - https://www.books2read.com/b/LostSolace - it is still a bit clunky, but better than random letters. It is also possible to drop the www. 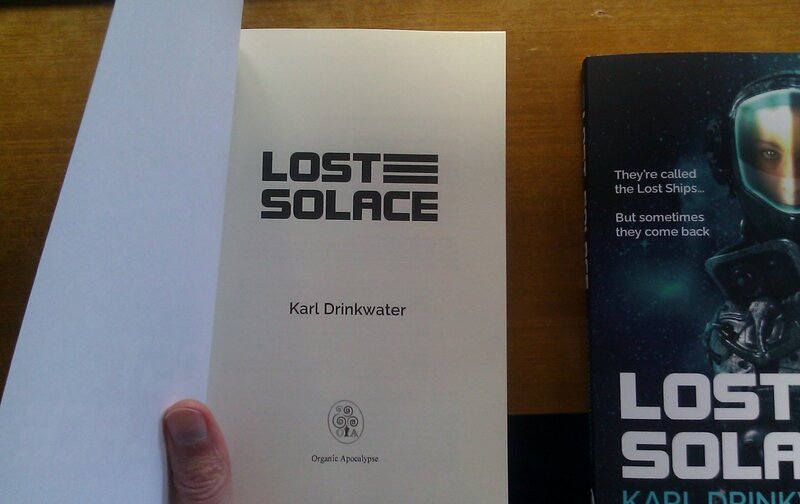 and the /b/ to turn the custom link into books2read.com/LostSolace which then points the the UBL. I don't know if that is intended behaviour or not, but it means we have one tidy URL for the UBL, and a less tidy one for the Book Tab. The shorter a URL, and the fewer awkward symbols that need typing, the better. There is also a new author page feature - a nice addition, but another ugly URL (mine is https://www.books2read.com/ap/xr55B8/Karl-Drinkwater ). It would be good if a consistent tidy URL system was created for the author (author page and signup page) and individual books (Book Tab and UBL), with all those four tidy links available in one part of the admin interface for copying and sharing. None of that is a big issue, and the D2D interface is generally very clean and easy, but the issues of custom URLs strike me as a great new feature that just hasn't yet been neatly implemented yet, leaving rough edges like those mentioned. Teasers - it's common to include a "teaser" at the end of a book - the blurb about some other title the reader might enjoy by the same author. In my own books I include 1-3 of them, with the title, blurb, and usually a review quote. D2D give the option of including a teaser or not, thought you are limited to only one. And that's fine. I think it is tidy and prevents reader fatigue. I also love the way they include the cover for you. So I actually prefer what D2D have done here to my own custom interiors. It's also much less admin work for me. 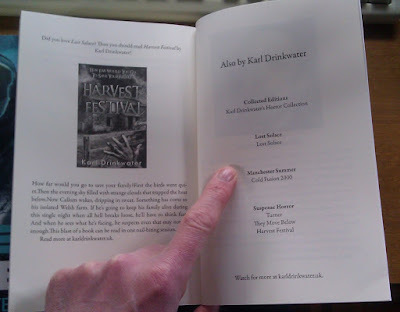 Also by Karl Drinkwater - because I include a few teasers in my own books I haven't felt the need to build in a list of all my books, but as you can see in the image above, D2D offers it as an option. I really like that. One of the reasons I can't be bothered doing it manually is because you have to update it in every book, every time you release a new title. It soon gets old. But D2D will update it for you every time you release a new book, across all your titles. That's a big time saver. My only issue with D2D's "Also By" list is that it is purely geared up for series, and there are no options that could make it more flexible. Let me explain. A series is a set of books that tell an overarching story as you read them. Within the series they will each have a number - you read #1 before #2 etc. D2D works brilliantly if all you write is series, and D2D interconnects the data in meaningful ways (e.g. adding the position in the series to the title page, as we saw). However, what if some of your books are in a series, and some are standalone? What if your books aren't in a series, but are in multiple genres? Then it gets rather clunky. To make use of this D2D feature your only option is to create a fake series for standalone books or for genres, as I did above. It looks clean enough there. However, it has the unfortunate additional effect that the books will be numbered and treated as if they are part of an overarching story even if they aren't connected. So my suspense horror books are standalones, but D2D will distribute them to vendors who display each book as if it is part of a series - book #1, #2 etc. That can be misleading, but it is currently my only option if I want the benefit of automated Also By lists. And I have to take collected editions out of the fake series because they include books already in it, and it would be even more confusing for "book #4" in my horror series to include books 1-3. You also can't change the order of the "series" on the list - the order is determined by series (alphabetically) and then volume number within the series. For standalone books, it's put in order by release date (oldest to newest). You can't change that sorting. I've raised this a number of times with D2D. It is fairly easy to fix - as well as treating series as they do at present, they could also enable books to be categorised and grouped in other ways such as genre (which then wouldn't list them as "book #1, book #2 etc). And they could enable the author publisher to see the current list of titles and categories, and choose the order they appear in - so that, for example, the most important genre/series could go first if desired, or there could be a graduation in themes, or any other sorting method the author chose to implement just by dragging the series/genre titles around. It would then be a really powerful and flexible tool for updating the lists of all the titles by that author (done once, then having the same list shared across all books). UPDATE 15th NOVEMBER 2018: I just found out that D2D have introduced custom carousels to author pages and book tabs. It's a really nice feature. And I immediately thought "Excellent, that is a good way to let the author rearrange books by any system, such as genre". So D2D have something in place that does exactly what I've asked for - all they have to do now is add an option to "Automated End-matter > Also By" to use the Custom Carousels as the listing of books and categorisations on that page, rather than the automatic breakdown by series - then people who don't write series could still use this to group books by genre, or any other system. And people who prefer the default series breakdown could just leave the option unticked and continue as before. Please do that, D2D! One other enhancement that would be nice in the e-books (not the paperbacks) would be for the book titles to link to the Book Tab or UBL for each title, to make it easier for e-book readers to view and buy any other books. The fewer the obstacles in the way of a purchase, the better. At present the person reading the e-book would have to remember the title of each book they might be interested in, leave the e-book reader app, open the browser, go to one of the vendors, and search for each title individually. Making each a link would be so much easier. Note that vendors don't allow links to other vendors in the e-books they sell (so you can't link to an Amazon book within a Kobo-sold title etc). However, the UBL or Book Tab could get round that, because it would be a link to a Books2Read site instead. D2D support once told me "by using the universal book links for the links from these pages to those books, you can get them live without fear of rejection for competitor reference links within the file". Or, if that wasn't acceptable (and maybe this idea is preferable anyway), D2D could insert the correct vendor URL for each vendor. So their systems would insert the Amazon URLs for each book when they distribute a mobi file to Amazon, and Itunes links when they distribute the same title to Apple, etc. It's a bit more work, but would probably increase sales. All e-books include a Table of Contents (ToC) to make navigation easier. 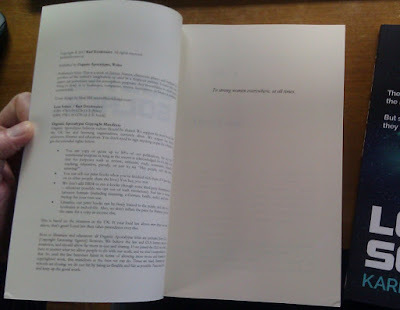 However, a ToC is not needed in most print books (and the presence of a ToC in many cases looks amateurish). D2D didn't include one, and that's good. It matches my custom interior. The one exception is with short story collections (or poetry collections) - it makes sense for even the paperback of those to include a ToC. D2D doesn't include the option of adding one at present, which severely limits the usefulness of the D2D PDF as an interior for short story collections. This article has already been long enough so I won't expand on them here, but if you want to know more about any of these issues below (e.g. if you are affected by them) then get in touch and I'll tell you more. They are all issues that I have raised with D2D support in the past. D2D has a few issues with certain layouts where D2D over-rides the settings and the only workaround is to do some special fiddling with paragraph styles to get D2D to respect the format. I've found that with poems and blank lines in the past. It ties in to my request above about how it would be good to know what the D2D conversion process does and what settings it ignores - that would explain why some of these issues occur. Another issue can be with ToCs for the e-books. 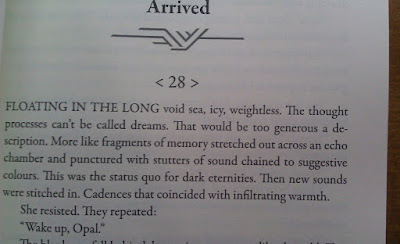 D2D has a few ways of guessing at what counts as a chapter title, and they generally work, but not always. It would be handy if D2D's chapter detection included an option to pick by style, so I could (for example) include the style "Chapter Title" but not include "Subhead no TOC" (which isn't included in the TOC when I manually generate epubs). I use proper styles so the bold and larger text options in D2D's ToC generator are sometimes too simple, since I may use bold and larger text for things that aren't chapter titles. D2D's autoconversion script sometimes incorrectly interprets text as being a title page. Really it should not do that unless the title and author name are both present and exactly match the book’s metadata. If the author ticks “Title Page” under “Add End Matter?” then that should also over-ride any automated checks – if the author is saying to add a Title Page it should mean there is none already present and that part of the auto-conversion should be bypassed. But I have had a few issues with collected editions where D2D incorrectly interprets one of the pages as a title page for the whole collection. 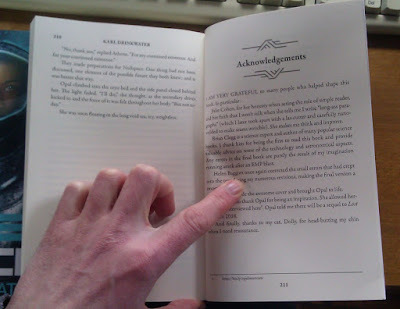 While I am talking about improvements, there’s another one I’d love to see – in the book preview on D2D there are buttons for going back and forward by a page, and by a chapter. That’s great, but there should also be a button to go to the start of the doc. As an example, if I am testing the ToC to jump to a chapter near the end, I then have to click “previous chapter” loads of times to get back to the start. Likewise if I am trying to compare sections. Since the navigation ToC is at the start, a button letting me jump to the start (or to the ToC) would be great. 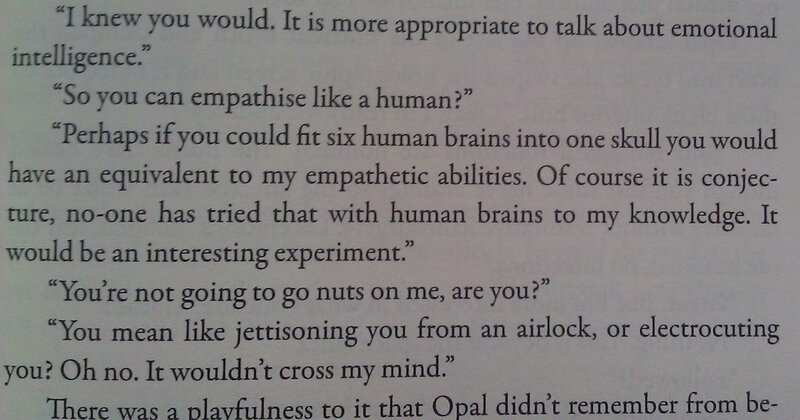 I’m sure other authors would appreciate that too. "We downgrade the images to 72DPI for ePub, mobi, and PDF file format [for file size reasons as large files] can be problematic with our system since our site only allows 50MB or less for a file size." I did note that even at 72DPI D2D's files have fairly crisp images, which is a pleasant surprise. As such, I think 72DPI can be just about doable in some print books, but it really depends on the image. If it is heavily textured then it isn’t as noticeable, but if it has crisp lines (such as images with text in, or some colophons) then it ends up being quite blurry at 72DPI. 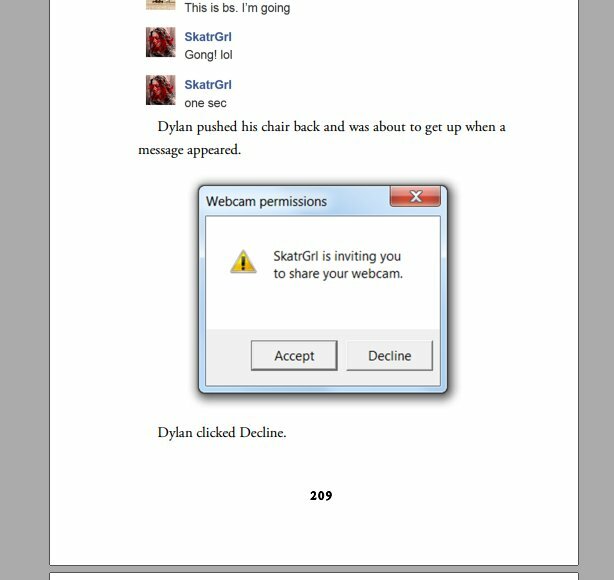 I sent D2D an example from one of my own books, where part of a story is told by Facebook messages and Windows errors. For those I used images, to make it appear as authentic as possible. I have screenshots of how it looks in the 300DPI print version I normally use, and in the 72DPI version D2D generated. 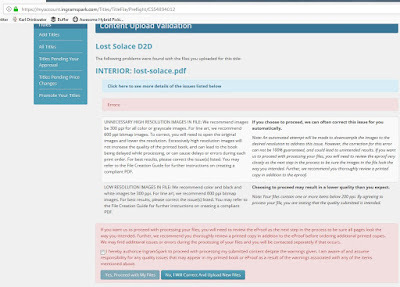 "Our scene break and heading images I've verified at 300DPI however I did find a logo on our New Release Sign up page that was exceeding the 600 DPI which is the reason for the message. I have put in a request with our Dev team to reduce this moving forward. I don't have a time frame for when that will be corrected but a fix request has been submitted to correct this. Thank you for your input on this issue." 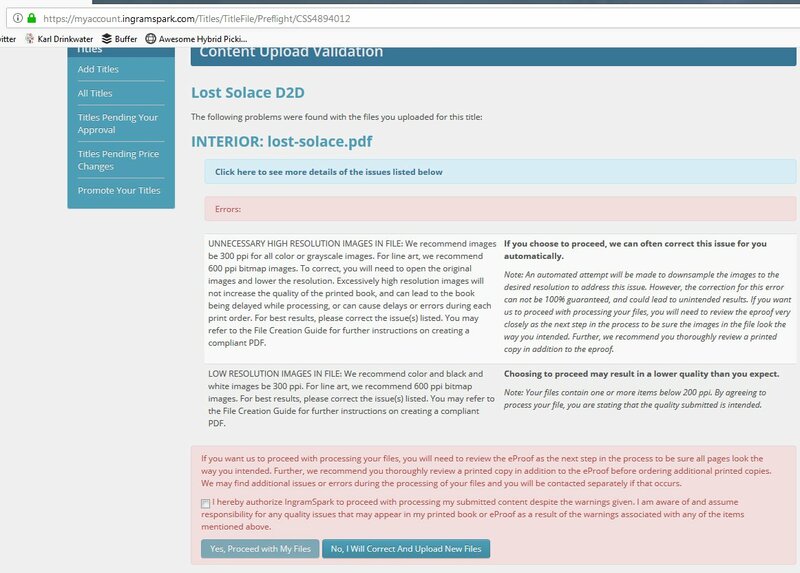 Hopefully the rogue 600DPI image issue is fixed now, but it's interesting that this D2D support message said the D2D scene break and heading images are 300DPI, yet earlier I was told D2D convert all images to 72DPI. Putting this together, it suggests that D2D use 300DPI to make their own images crisp, but downgrade the author/publisher's images to 72DPI. However, if it is acknowledged that 300DPI is needed, then it should be used throughout. Therefore, this is something that I’d like D2D to consider in the future, since there are two options that would make the D2D PDFs much more useful. 1. Increase the DPI for print and ebooks to a higher DPI– maybe 220. Why am I proposing this? I just checked the e-book file for my book with the most images, which are all at 220DPI, and the total file size is only 6MB – so I think in many cases 72DPI is overly conservative, and it would be safe to set a higher DPI as an e-book default (if someone’s uploaded file was over 50MB, obviously they’d have to downgrade their images, but I imagine in most cases it wouldn’t be that big). Maybe even 220 DPI, which would be crisp in e-book and print, and still not be too large (whereas 300DPI leads to about a tenfold increase in file size, which would definitely be too much – the same book is 81MB at 300DPI). The 220DPI file size is still small enough for e-books, but would just about work for print too. Just as e-book vendors keep increasing the acceptable dimensions for book covers as the resolution of e-book readers and tablets grows, there’s a need to increase the DPI of images too, so they don’t fall behind. 72DPI was fine in the past, but is perhaps starting to show its age - and, as the IngramSpark error message above showed, the new standard for line art is 600DPI, not 300DPI! 2. 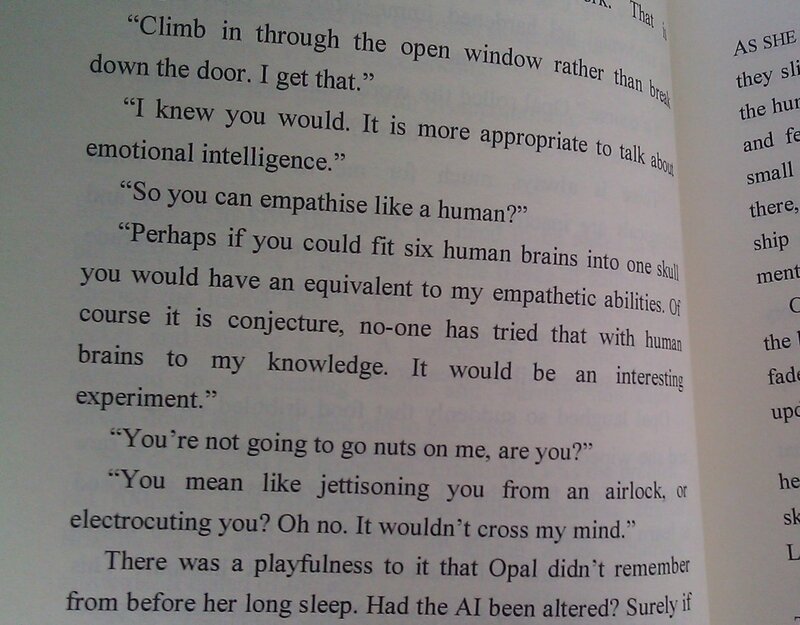 Or D2D could have one DPI for e-books (72, or even a bit higher e.g. 150, or 220), but another higher one for the print PDF (ideally 300, though 220 may work). With this option they wouldn’t necessarily do much to their current e-book conversion process – they’d just change the DPI parameter for the print books' PDF output (which needs a higher DPI than e-books anyway). 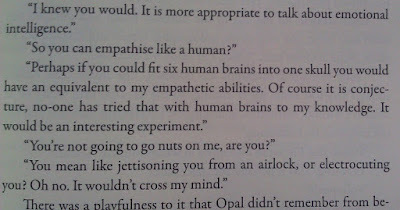 Either of those would then hopefully create crisp paperback interiors that visually match the e-books (fleurons etc). I'm fairly happy with the D2D interiors. They save a lot of time, and removing user choice helps to keep the process simple. I'd like to know more about what happens (see next point), and have easier ways of controlling the appearance of the Title Page (or Half Title) and the way genres versus series are dealt with. Lastly - it would be very useful if D2D had a page which listed everything their conversion process does to the source file in order to turn it into their PDF interior, each step that takes place. Also all the settings chosen - how many styles they apply, what each one is, formats (bold, italics, hyphenation, font and size, spacing etc), margins and so on. Also a list of what Word settings their conversion processes keep, and which they over-ride (such as hyphenation). It would save having to second-guess their conversion process, or wasting time creating styles with settings that will be ignored anyway. This would also offer some security to people considering switching to D2D's print interiors - if ever D2D stopped offering the service it would be fairly easy to make new books match your existing ones (or manually make changes that were visually consistent). At present you have no safety net, and if D2D folded or stopped offering book conversion you would have a difficult task to try and make new books match the ones they had converted. But overall, despite a few issues, I'm impressed with D2D as a tool for creating quick and easy PDF paperback interiors. And I was already impressed with them as an e-book distributor - I moved to them after Pronoun's closure, and have never regretted it. Excellent post. I am considering D2D for print for my new book. Regarding wide distribution would you prefer D2D over Amazon for print? Bookstores may be more willing to buy print editions from one of D2D's print order services than if Amazon was mentioned. Have you looked into this? Thank you for the excellent detail you provided. The print D2D interiors are available to everyone for free, but D2D's print distribution is in beta and only available to a few so I haven't tried it. I use IngramSpark to distribute my paperbacks (partly for the reasons you suggest). Thanks for the comments - I'm always happy to help my fellow authors!